Dubai, UAE, July 05, 2018: Summer is here and that means time to enjoy all of the fun activities under the sun. What’s not so fun however is the havoc the blazing summer sun can wreak on your skin. Sheet masks are a great addition to your skin care routine any time of the year, but they’re a perfect way to renew skin during the summer months. Sheet masks tend to force feed your skin beneficial ingredients and the mask keeps the ingredients from evaporating too quickly. Loaded with rich ingredients that help combat any skincare concern, using sheet masks is the perfect way to unwind and relax on a hot summer day or even while traveling as they offer portability and convenience. Whether you struggle with chronic acne or an annoying breakout, this facial sheet mask is drenched in a spot fighting serum for a clean and clear complexion. The summer sun can lead to unwanted sunspots, pigmentation, wrinkles and loss of elasticity in the skin. You can fight these signs of ageing with this facial sheet mask that is drenched in a powerful antiaging serum for younger looking skin. Collagen, Elastin, and Vitamin E help to revitalize the skin’s elasticity, tone and firmness. The mask helps to minimise the appearance of fine lines and deep wrinkles. Skin appears smooth, firm and more youthful. For those with naturally dry skin, the summer and the heat that accompanies it, may sometimes cause even drier skin. Activities such as swimming can also cause flaky skin. This face mask is packed with an intensive recovery serum for nourished skin. The serum enhances skin’s elasticity. Ingredients rich in Vitamins, Antioxidants and Amino Acids help to hydrate, nourish and revitalize. CoQ10, Caviar and Witch Hazel help to protect the skin and reduce redness, for a youthful appearance. Traveling can cause jet-lagged, tired and dull looking skin, which is no fun at all. 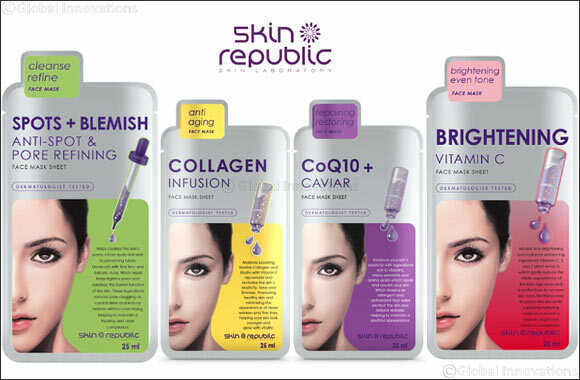 This sheet mask from Skin Republic boasts a brightening serum for a luminous, glowing complexion after just one use! Brightening radiance enhancing Vitamins C, E and 7 Plant Extracts help reduce the appearance of age spots and imperfections for a bright and even skin tone. The mask hydrates and revitalizes the skin to reveal a radiant and luminous complexion. It’s even perfect for in-flight use.